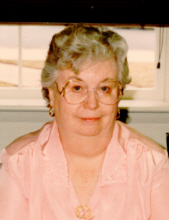 Elizabeth P. “Libby” Kiracofe, 88, of Bridgewater, passed away Sunday, November 11, 2018 at Sentara RMH Medical Center. She was born in Sugar Grove, WV on August 20, 1930, and was a daughter of the late Perle Eston and Ella (Dyer) Puffenbarger. Libby graduated from Bridgewater High School, class of 1947. She retired as the assistant branch manager at First Virginia Bank in Bridgewater. She was an active member of Bridgewater United Methodist Church since 1936. She was united in marriage on September 25, 1948 to Robert E. “Bob” Kiracofe, who preceded her in death on October 18, 2003. She is survived by four children, Gregg Kiracofe and wife Barbara, Scott Kiracofe , and wife Lisa, Kevin Kiracofe and wife Debra, and Jennifer Sager and husband Terry. a brother, Robert "Bob" C. Puffenbarger and wife Mitzi Lee. She is also survived by her granddaughter, Amanda Sager-Spitler and spouse, Bridgette; three step grandchildren, Jessica Kliene, Gabriel Hoak, and Aspen Hoak; five great grandchildren, Elizabeth Sager-Spitler, Robert Matthew Sager-Spitler, Delilah Kliene, Annabelle Kliene, and Jolene Kliene. She was preceded in death by a sister, Louise Lacy; two brothers, Jack Dyer Puffenbarger, and James Earl Puffenbarger; and step grandson, Justin Roberts. A funeral service will be held at 1:00 PM on Thursday, November 15, 2018 at Bridgewater United Methodist Church with Rev. Stephen Creech and Rev. Jim Harris officiating. Burial will follow at Oak Lawn Cemetery. The family will receive friends on Wednesday, November 14, 2018 from 6:00 to 8:00 at the Johnson Funeral Service in Bridgewater or anytime at the home of Jennifer and Terry Sager. In lieu of flowers, memorial contributions may be made to Bridgewater United Methodist Church 219 North Main Street Bridgewater, VA 22812. To send flowers or a remembrance gift to the family of Elizabeth P. "Libby" Kiracofe, please visit our Tribute Store. Rev. Stephen Creech and Rev. Jim Harris officiating. Burial to follow service. "Email Address" would like to share the life celebration of Elizabeth P. "Libby" Kiracofe. Click on the "link" to go to share a favorite memory or leave a condolence message for the family.